George Clarke was born at Wymondham, Norfolk, England on 27/1/1798 died at Grove Cottage, Te Karaka, Waimate North, on 29/7/1875. Between the ages 11 and 20 George served nine years in the gun-making trade under his father William Clarke (builder), before going to London in 1818 to gain further experience. He joined the Church Missionary Society training school at Islington. He was not ordained and later served as a catechist and lay missionary. Returning in October 1820, he renewed acquaintance with the Reverend Henry Tacy, an Evangelist, who was successful in persuading James Kemp and his friend, George Clarke, to join the missionary cause. George became a missionary teacher, and was assigned to N.Z. by the Church Missionary Society in 1822. There is no record of how George came to marry Martha Elizabeth Blomfield, but circumstantial evidence rather suggests that it was a marriage of convenience. As children they had attended school together under Henry Tacy in Wymondham but their friendship probably ended when the Blomfields moved to Wortwell after 1809. The CMS regarded a wife as an essential part of a missionary’s equipment in a heathen land. It was very possible that the ever-helpful Henry Tacy, with his many Evangelical connections, was aware of their respective needs and acted as a go-between. Certainly it was he who married the young couple at Swanton Morley in Norfolk on 14 March 1822 - 5 weeks before they sailed for New Zealand. Martha Blomfield, born at Wymondham, 11/12/1802. Martha was the second of six daughters of Rev. Ezekial Blomfield and his wife, Mary Anne Fennel. On 17 April the Clarke’s left London for Gravesend to embark on the “Heroine,“ Captain Ostler. Seasickness had begun for the Clarke’s as soon as the ship had left Gravesend, but where George was ill for ten days, Martha suffered from nausea and a chest infection for the entire voyage. The surgeon had abandoned all hope for her by the 17 June and only a week in Rio revived her. The Heroine reached Hobart on 10 September 1822. The voyage resumed on 6 October and ten days later, almost six months to the day since they left England, the Clarke’s arrived at Samuel Marsden’s establishment at Parramata. Samuel Marsden was the senior government chaplain in New South Wales. He was the founder of the New Zealand mission and the Agent for the CMS in the South Seas. Marsden was determined that Clarke should not go to New Zealand until those awaiting him clearly understood his occupation was to be that of teacher, not gunsmith. At this time in New Zealand Hongi Hika was engaged with his Ngapuhi warriors in the most murderous military campaigns ever known in MÄori history. In July 1822 the chief defeated and slaughtered some fifteen hundred Waikato MÄoris and in the previous year two thousand Ngatipaoa and Ngatimaru had suffered a similar fate. Hongi owed his victories to their possession of a thousand muskets - three hundred of which he had obtained with the help of Thomas Kendall. John Butler, whose temper and alleged drunkenness disqualified him, in Marsden’s opinion, from a missionary career, and Kendall, for his musket trading and disgraced by his affair with Rakau’s daughter, were dismissed from the Society. A new Superintendent, Henry Williams, was appointed and a set of regulations for the conduct of the Mission was left. On 19 June 1823 Marsden engaged the Brampton to take him and the Williams to New Zealand. Ten days later George and Martha gave birth to their first child, George Clarke Jnr. But a serious illness weakened Martha still further. George and Martha stayed and so, on 22 July 1823, Marsden and the Williams sailed, leaving Clarke employed at the Native Institute. They spent over a year at Parramata working at the Aboriginal settlement. Marsden returned from the Bay of Islands at the end of November with the assurance that the Clarke’s could now safely proceed to New Zealand. Jan 1824, securing passage on the French Corvette “La Coquille”. (Captain was D’Urville, late Admiral) they left for New Zealand. George, and Martha arrived at the Bay of Islands on 3 April 1824, and proceeded to Kerikeri to be welcomed by Henry Williams. 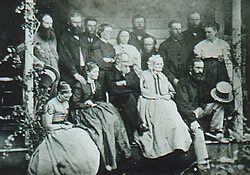 They took up residence, at the new Church Missionary Society station “The Kerikeri Mission House” the residence adjacent to the falls and later to become the famous Kemp homestead. Clarke quickly came to like and respect Hongi, although he disapproved of his enthusiasm for war. He knew Hongi well and enjoyed his friendship though Hongi always resented his refusal to practice his trade of a gunsmith. Clarke established a school for MÄori children, at which he taught elementary school subjects and useful crafts. Clarke acquired the language so rapidly that he was able to assist Marsden on his next pilgrimage in New Zealand. Clarke’s appointment to Kerikeri was due to his past friendship with the Kemps. The two men had known each other since their schooldays in Wymondham. In December 1823 Kemp began a school in Kerikeri but by March 1824 only 3 pupils remained. George and his family moved into the Butler’s old house while Kemp went up to recruit pupils for the school; between 1824 and 1830 the school attendance gradually increased. After 1828 he tried to persuade his father to come to New Zealand. He sent home sums of money and wrote letters telling of his circumstances. He also described the progress made by the MÄori in reading, writing, mathematics, ‘civilisation’, and acceptance of the Gospel. When news reached Kerikeri that Hongi had been wounded at a battle in the Whangaroa, and was not expected to live the settlers fully expected to be plundered at any time. Clarke, Kemp and Hamlin hastily buried most of the mission’s trade goods and packed up their linen, china, and books and dispatched them to Paihia, together with Mrs. Clarke who was far advanced in pregnancy. As it turned out Hongi lived for another fifteen months and at the time of his death in 1828 a crisis at Hokianga distracted the MÄoris from plundering the settlement. Between 1830 and 1831, with William Yate, Richard Davis and James Hamlin, George Clarke founded the Waimate mission station. Land was purchased at Waimate North, the chosen site for the mission: 735 acres in August and September and a further 300 acres in October. A road was built, and a bridge, with a 64-foot span, across the Waitangi River. To enable carts and supplies to reach the farms site the missionaries and their MÄori helpers had to construct 15 miles of road through rough country, and to bridge two rivers, and to cut a way through a small forest. After four weeks of marking out the best route for the road Clarke and Hamlin began work on the bridge across the Waitangi on 24 May 1830. The design and construction of the bridge was Clarke’s responsibility and, as he later admitted, it demanded all his mechanical powers. The swift flow of the river would not hold a middle pier so it was necessary to build a single span of sixty-four feet - a major undertaking with the materials and skills at hand. From bridgebuilding and road-making, George turned his energies to carpentry, carting and architecture. Sheds had to be built first to accommodate the families. Native puriri was felled and by 1831 three substantial sheds were erected. Clarke, who had learned from his builder father, was the acknowledged expert, and supervised the building of the three houses for the missionary families. In June 1832 the families moved into their new homes. From 1831 to 1839 Clarke and Davis managed the CMS model farm at Waimate North and for part of the time Clarke acted as secretary of the CMS committee in New Zealand. Clarke had good cause to be grateful for his past experience, for the establishment of the mission required all the resources of skill and energy. The missionaries had to be “jack of all trades” and master of many. As well as his work on the farm buildings, the houses and chapel-schoolroom, Clarke had to supervise the sawyers, shingle splitters, fences and brick-makers and to assist Davis in all aspects of farm work; to teach school in the mornings and to preach at the local Maraes alternate Sundays. When one considers this spread of effort and the absence of skilled labor, the missionaries’ achievements in the early stages of the Waimate mission are impressive. George, because he had learnt the MÄori language, was an interpreter at the signing of the Treaty of Waitangi. In 1840 Clarke reluctantly left the mission to take up a position in the newly established colonial government; he was appointed by Governor Hobson as “Protector of the MÄori People,” and Commissioner for the purchase of such wastelands as the natives wished to sell. With Henry Williams he advocated British intervention in NZ. So far as his official position was concerned, he believed ’Nothing will be done affecting the New Zealanders (the MÄori) but through me and those who are placed under me’. The reality was different. Clarke came under scrutiny from the three separate groups: the government, the settlers and the MÄori People. None accepted Clarke’s view of his role, although at first the government, because of its lack of resources and expertise, paid heed to Clarke and used him successfully in intertribal and inter-racial disputes. However, it was soon clear that Clarke was expected to protect MÄori interests, and on the other hand to act for the government in land sale negotiations. As a conscientious chief protector, Clarke could not have achieved popularity with the settler community even if his origins had been impeccably middle class. The group, which represented settler opinion, the New Zealand Company, regarded the Treaty of Waitangi as a praiseworthy device for the moment, and had no patience with Clarke’s high-minded approach. Clarke had no doubt that there were only two options for the MÄori people: government protection of rights and property, or oppression. Early on he correctly predicted trouble at each of the NZ Company settlements and sought to forestall it by requesting a larger protectorate staff, comprising men of high moral caliber. As there were few people fluent in both languages - regardless of their morals - Clarke’s strategy was clearly doomed to failure. During the first two years as chief protector Clarke was able to report on the largely peaceful relations between the two races, as a result. However, he had to admit that forbearance was not exercised in disputes between tribes and he attempted to mediate in such conflicts. Inter-racial tension was first violently manifested at Wairau in June 1843 when New Zealand Company representatives and settlers from Nelson tried to forcibly arrest Te Rauparaha and Te Rangihaeata. The settlers were routed and 22 killed; there were at least four MÄoris killed. Clarke’s assessment of the affray has stood the test of time better than most. He judged that the settlers had provoked trouble by their aggressive approach, although his description of the MÄori participants as “inoffensive’ might be debated. Clarke did not always oppose settler interests, just as he did not always support MÄori causes. He was unsympathetic to Hone Heke, attributing his disaffection to personal ambition and the agitation of disgruntled white people particularly Americans. Generally, however, Clarke suspected the motives of settlers and was only too aware of his ambiguous position as a servant of the government and a guardian of MÄori welfare. When copies of the 1844 House of Commons report of the select committee on New Zealand arrived in the colony, Clarke was dismayed by its recommendation, which favored settlers. He rightly foresaw that the substance of the report would soon become known to the MÄori people and would exacerbate their growing distrust. George held the post for six years, being held in high regard by Hobson and his successors, Shortland and Fitzroy. His advocacy of the rights of the natives made him unpopular in the Company’s settlements. It was his advice, which led to Nopera’s war. He advised also on the claims of Waikato in north Taranaki and on the purchase of the Waitemata (which has never been impugned). He had great influence also with Governor Fitzroy, who relied upon his advice; but Governor Grey was less impressed with his qualities. He recognized the incongruity of a protector taking part in the purchase of native lands, and later question the validity of his own landed possessions. Grey said that Clarke had little contribution to make, but he had his own policies and ambitions and, moreover, thought he might become popular with settlers if Clarke were dismissed and his personal land purchases challenged. The protectorate was abolished in 1846 and Clarke was offered a position with much less responsibility, which he declined. George Clarke was also acting on behalf of the administration in the purchase of MÄori lands and the deeds for the purchase of the site in Auckland is written in his hand. In 1846 Clarke reported that he “would leave the Government service, conscious of having prevented much evil and mischief although I may not have effected much positive good”. George and Martha returned to Waimate to live in Grove Cottage with his son Henry Tacy Clarke, Marsden, John, Martha, Sarah and Henrietta. Clarke returned to duty as New Zealand secretary of the Church Missionary Society, but after complaints by Governor Grey, the C M S severed Henry Williams and George Clarke’s connections with the Society in Nov 1849. In 1851, Clarke did not resume the relationship when he was given the opportunity, but Henry Williams did. George was elected in Sept 1852 to the Legislative Council of New Ulster (which never met). In the following election (1855) he was defeated. He was appointed civil commissioner in the Bay of Islands in 1861 and Judge of the Native Land Court in 1865. George was a man of his time in that he believed his race had a civilizing mission among the heathen. However, unlike most of his compatriots in New Zealand, he had a genuine sympathy for the MÄori people. He was, moreover, idealistic at a time when idealism was in short supply. He has been criticized for his hostility towards settlers. It is true to say that Clarke himself was a settler who bought land at a time when it could be acquired easily and cheaply. Yet in general his intentions were unselfish; the same could not be said of most settlers. His distrust of them was nearly always justified. Clarke made a positive contribution in the early years of European settlement. George and Martha lived the remainder of their lives at Grove Cottage, Waimate North, with their land being divided up between their sons, Marsden and John farming Grove Cottage in the later years. Martha died at Waimate North, 8 December 1882. George died at his Grove Cottage home on 29 July 1875. His funeral service at Waimate was conducted by MÄori ministers.